After the success of Bahria Heights 1-6, Bahria Heights 7 is set to create a stir in Rawalpindi. Situated just 1.5 kilometres from GT Road, right at the entrance of Bahria Town Phase VII, the lavish building provides a good mixture of comfort, luxury and unique offerings. Booking for the semi-furnished 1- and 2-bedroom apartments is currently open. Interested? Let’s see what this project is all about! According to the developer, the apartments on offer will be equivalent to the rooms in 5-star hotels in terms of luxury. The building comprises a ground floor and four additional floors, and the units measure 1021 sq. feet to 1822 sq. feet, which makes them more spacious than traditional apartments. And that’s not all. These units are also semi-furnished! They are equipped many fixtures and fittings needed for a fully-facilitated lifestyle, including a state-of-the-art cooking range, microwave, dishwasher, and even reversible air conditioners. The building will be equipped with three elevators, including a cargo lift, 24-hour security, a commercial area on the ground floor and a restaurant. The top floor will have a gymnasium for residents and a free dormitory for domestic help. Construction on the building began in February 2015, approximately 8 months ago, and the ground floor has been completed while work on the remaining four floors is underway. According to sources, construction was at a standstill for a while but it has successfully commenced once again. Bookings opened in April 2015. Real estate activity is steady at the moment and overseas investors from Dubai, Oman, and Europe have shown interest. Booking for the commercial floor is nearly complete, while residential units are still available. Ms Shumaila Malik of Bahria Heights 7 told Zameen.com that possession may be granted in around 2 to 2.5 years, when construction is complete and some instalments have been paid. Right now, the project looks highly promising and will probably be a good addition to the growing number of luxury apartments in the country. 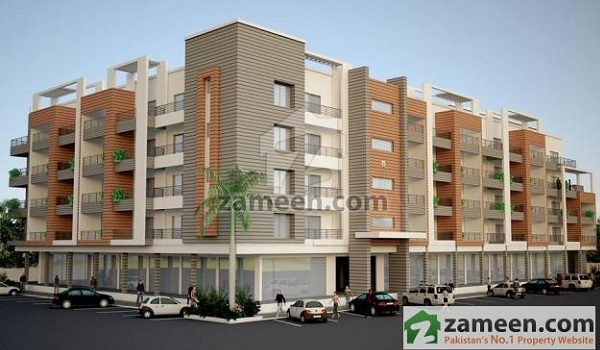 Do you think Pakistanis will start preferring apartments to bungalows in the near future? Let me know your thoughts in the comments section below.